You’ve heard of the Oscars and the Grammy’s awards, and last year you stayed up all night to watch the Emmy’s to see your favorite star walk down the red carpet with her Harry Winston diamonds, Ralph Lauren gown, and unbelievably high Jimmy Choos. Let’s welcome you to another kind of award. These awards may not be as glamorous and may not drive the media into a feeding frenzy, but they award the right set of grey cells. No, I am not referring to the Nobel Prize, but web awards which are given to some of the most creative websites ever. This article is dedicated to those awards which make the web what it is today. Not only do these awards add a bit of style to the website design, but they provide a large modicum of respect for web designers both within the community and with their clients. The Webby Awards: The Webby Awards have been around for ten years and can be considered as one of the oldest, well established awards on the internet. They are governed by The International Academy of Digital Arts and Sciences. There are close to sixty five categories of awards and each award has five nominations. You know that the Webby Awards mean serious business as the judging process is monitored by PricewaterhouseCoopers. Nominations to the Webby Awards can be done online and receiving a Webby Award can pave a designer’s road to success. Even Webby Nominees are very highly respected within the creative design industry. The Golden Web Awards: The International Association of Web Masters and Designers ( IAWMD) promote the Golden Web Awards which practices the democratic principle of ‘by the people, for the people’. The awards are given based on a custom web design range of parameters which are defined by the members of the association. Since this is by a professional body, there is a lot of emphasis on technical accuracy and conformance to the best development standards. If you are impressed by numbers, you might like to know that there are 400,000 IAWMD members in close to 150 countries! Though some of the website design awards are offered by professional organizations, there are some awards which may also be considered haute couture awards for creative website designing. One such award is the Fcuk Star Award. There are some excellent websites which are available for review on this site and you can submit your own website online as well. One of the key factors which define the nominees of this award is that the websites which are nominated are websites of well established brands. The internet is a place which is full of creative ideas. Thus awards sites are not far from these creative points. The Internet Tiny Awards is one such award which thrives on creativity and has a new featured site every week. Apart from distributing awards, the Internet Tiny Awards website provides some excellent content and community tools for the website design fraternity. This award has been around only for three years and has managed to create a niche for itself. If you are a custom web design, then it is definitely worthwhile to check out these website design awards which can give you information on the latest design as well as give you an opportunity to compete. If you are looking for a good web designer for your website, looking up these website design awards can get you connected to some of the best website designers. 1. NAAIP goal is to have every insurance agent in USA use our websites for their business. 2. Over 8,000 have signed up already but the key is to get the agents to put on their domain name with proper hosting and do the steps to move the search engine, google business,etc. 3. Only in past year we are offering proper hosting, with name servers or A record IP.. so about 3,000 are using the proper method. 4. Others are doing forwarding/masking, initial naaip.org/agentname - or not even using it. 5. The quality of the website is much better than before. But it is still being worked on, additional features. etc. 6. We want to have exclusive partners that provide good deals. 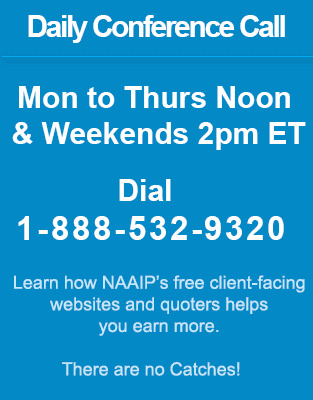 Wanting agents to recognize NAAIP as the place where you can go for good deals. 7. Obviously, a good idea. Implementation is the hard part. Others, I guess were impressed and wanted to destroy us before we succeeded. 8. Insurance-forum deleted all mention of NAAIP - NAAIP is now a "bad word" on the forum. The moderator of the forum will do everything in his power to make NAAIP look bad now matter what. Negative from that forum will not be an issue in the future. 9. We have a daily, Monday thru Friday conference at Noon ET which is an open forum but concentrates on SEO to get people in our system. 10. We need exclusive partner for leads. BTW, if you google "live transfer final expense leads" and similar - near the top... Lots of calls for that.. We just tell them to sign up for the site, and whatever. 11. The main asset, is that that we lots of agents that will do whatever we recommend. 12. Very soon, Our adversary will be faced with the reality of thousands of agents suing them. Either individually or as a class. The opinion of the MIT expert witness came in. It is clear that our adversary did fraudulent claims that were designed to hurt NAAIP and agents.